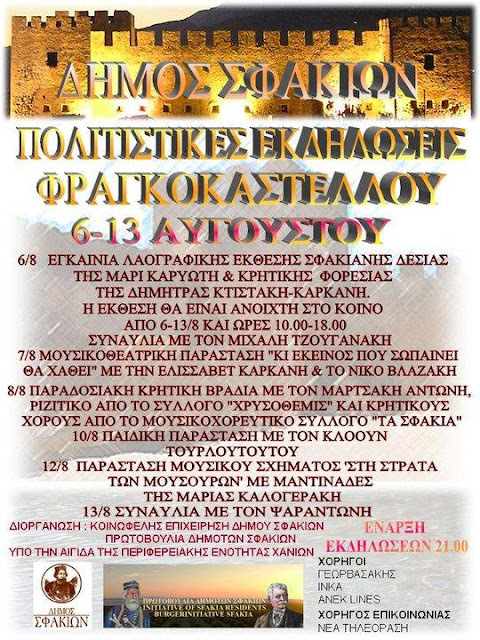 The Municipality of Sfakia in cooperation with the Initiative of Sfakia Residents is happy to announce the beginning of 2011 Frangokastello Cultural Events. A celebration of Culture and History that will take place in the imposing Castle of Frangokastello under the patronage of Chania Regional Unity. 8th of August: Traditional Cretan Night with Martsaki Antoni, Rizitiko performed by the group "Chrysothemis", and Cretan dancing by the Sfakian dancing group named "TA SFAKIA". ΜΕ ΜΕΓΑΛΗ ΧΑΡΑ ΑΝΑΓΓΕΛΟΥΜΕ ΤΟ ΓΕΓΟΝΟΣ ΤΩΝ ΠΟΛΙΤΙΣΤΙΚΩΝ ΕΚΔΗΛΩΣΕΩΝ ΤΟΥ ΦΡΑΓΚΟΚΑΣΤΕΛΛΟΥ 2011, ΜΙΑ ΓΙΟΡΤΗ ΠΟΛΙΤΙΣΜΟΥ ΣΤΟ ΙΣΤΟΡΙΚΟ ΚΑΙ ΕΠΙΒΛΗΤΙΚΟ ΚΑΣΤΡΟ ΤΟΥ ΦΡΑΓΚΟΚΑΣΤΕΛΛΟΥ ΚΑΙ Η ΟΠΟΙΑ ΔΙΟΡΓΑΝΩΝΕΤΑΙ ΑΠΟ ΤΟΝ ΔΗΜΟ ΣΦΑΚΙΩΝ ΜΕ ΤΗ ΣΥΝΕΡΓΑΣΙΑ ΤΗΣ ΠΡΩΤΟΒΟΥΛΙΑΣ ΔΗΜΟΤΩΝ ΣΦΑΚΙΩΝ ΚΑΙ ΥΠΟ ΤΗΝ ΑΙΓΙΔΑ ΤΗΣ ΠΕΡΙΦΕΡΕΙΑΚΗΣ ΕΝΟΤΗΤΑΣ ΧΑΝΙΩΝ.